— Dr. Megan Sandel, Associate Professor, Pediatrics, at Boston University School of Medicine, testifying before Congress. Increases in household wealth are associated with better health outcomes for homeowners. Low-income people who recently became homeowners report higher life satisfaction, higher self-esteem, and higher perceived control over their lives. Renters who become homeowners not only experience a significant increase in housing satisfaction. They obtain a higher satisfaction even in the same home in which they resided as renters. Social mobility variables, such as the family financial situation and housing tenure during childhood and adulthood, affect one’s self-rated health. Homeowners have a significant health advantage over renters, on average. Homeowners are 2.5 percent more likely to have good health. When adjusting for an array of demographic, socioeconomic and housing–related characteristics, the homeowner advantage is even larger, at 3.1 percent. “It’s absolutely a healthier environment,” Mandy says about the home she built with Habitat for Humanity. 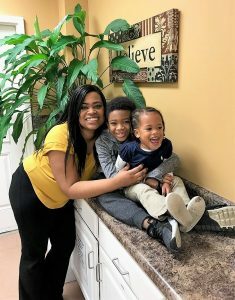 She had been living in a basement apartment with mold issues, an unhealthy environment for her and her two sons, 13-year-old Tyler and 15-year-old Kenny, all of whom have asthma. But breathing easier isn’t the only improvement to her family’s health that she has noticed. “I feel like people don’t focus on mental health when they think of the word ‘health,’” she says. Before moving into the home, the boys had to share a room. They didn’t have their own spaces. They lived “on top of each other,” she says. Now the boys have their own rooms — places where they can be on their own, sleep, decorate as they like and give each other the space they need. Mandy has her own space in the home and has noticed changes for herself, as well. A national survey of Habitat homeowners found that 74 percent said their families’ overall health had improved since moving into their home. Children in homeowner families outperform children in renting families in both math and reading achievement tests, even when other factors are the same. These children will have fewer behavioral problems, higher educational attainment and greater future earnings, according to a study by an Ohio State University economist. Habitat typically requires prospective homebuyers to complete financial literacy classes and to learn various methods of sustaining homeownership. A study by J.R. Bursik Jr. of the University of Oklahoma showed that a stable neighborhood is likely to reduce crime. The findings note that it is easier to recognize a perpetrator of crime in a stable neighborhood with extensive social ties. Education and income are directly linked to health: Communities with weak tax bases cannot support high-quality schools, and jobs are often scarce in neighborhoods with struggling economies. Unsafe or unhealthy housing exposes residents to allergens and other hazards like overcrowding. Stores and restaurants selling unhealthy food may outnumber markets with fresh produce or restaurants with nutritious food. Opportunities for residents to exercise, walk or cycle may be limited, and some neighborhoods are unsafe for children to play outside. Proximity to highways, factories or other sources of toxic agents may expose residents to pollutants. • Access to primary care doctors and good hospitals may be limited. Unreliable or expensive public transit can isolate residents from good jobs, health and child care, and social services. Residential segregation and features that isolate communities (e.g., highways) can limit social cohesion, stifle economic growth and perpetuate poverty. 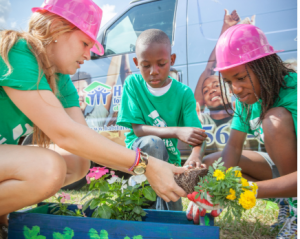 Habitat for Humanity has found that building strong neighborhoods in addition to housing — including community gardens, parks and engaged neighborhood associations — helps promote health and reduce poverty in the wider community. Habitat knows that the benefits of homeownership are indisputable. Since 1976, Habitat for Humanity has helped more than 22 million people worldwide with housing solutions leading to decent, affordable shelter. We will continue to work toward a world where everyone has a decent place to live, and where measurable improvements in health, education, security and wealth generation are enjoyed by more and more homeowners.